For this I cooked fresh cranberries in the vegetable broth and then blended them to get the vibrant red color for my soup. To maintain the crunchy texture of the soup so that I don’t miss biting on my food I sautéed garlic, sage leaves, bok choy and added onion powder for extra flavoring. I combined all the ingredients in the same pan and seasoned with salt and pepper and served myself a bowl of this warm Cranberry Bok Choy Soup. 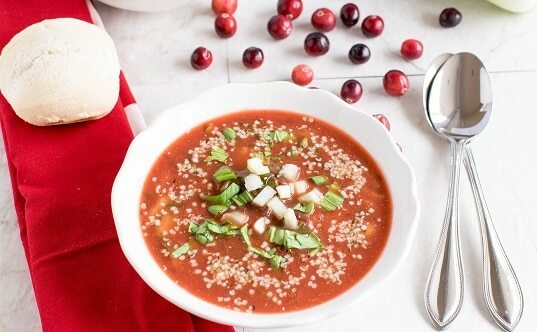 In a saucepan combine cranberries and vegetable broth and boil for 3-4 minutes or until cranberries become tender and soft. Remove from the flame and let it cool. (While cooling the broth will absorb the color of cranberries). Once cooled blend the broth and cranberries smooth. In a nonstick pan heat olive oil and add garlic, sage leaves, onion powder and chopped bok choy. Sautee until bok choy is translucent and does not have any raw taste. Now add the blended broth to the pan and let it boil for couple of minutes. Add salt, pepper, coconut milk and date syrup and cook in a low – medium flame for 2-3 minutes. Turn off the flame and pour it in the soup bowls. Top it with hemp seeds and enjoy it warm or at room temperature. This soup is mildly tangy in flavor so feel free to adjust the date syrup according to taste. Any sweetener (except honey) can be used in this syrup. This soup will pair well with dinner roll or your choice of bread.